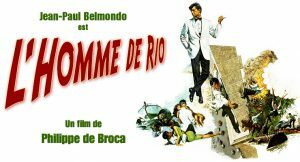 L’homme de Rio (That Man from Rio) is a 1964 adventure film directed by Philippe de Broca and starring Jean-Paul Belmondo and Françoise Dorléac. Storyline A young man comes to the rescue of his girlfriend abducted by thieves and brought to Rio. An extravagant adventure ensues.